Celia loves hearing from fans, though her writing schedule does not allow her to answer mail as often as she would like. Because many fans ask her the same questions, she has tried to provide the answers on this web site, and on her fan site www.merentha.org. Soooo…..If you have questions to ask, please read through the material on both those sites (especially the FAQ) before writing! Hopefully the information you are looking for is there. You can contact the author using the form below. The Wal-Mart of Fanfic with a specific section for Coldfire-based stories. The Official C.S. Friedman Fan Site. Created by fans, for fans. Books Reviews and Recommendations of Paranormal and Vampire Books! 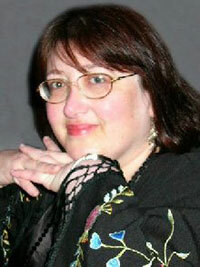 Celia’s primary publisher, provides writer’s guidelines for aspiring authors. Contact Russell Galen for rights inquiries. MZB’s site, provides outstanding advice for would-be writers and editors. Editor of The Erciyes Fragments, fantasy novelist, and a really cool guy. SFWA provides a wealth of useful information for both new and experienced writers. The artist who created the beautiful cover art for many of C.S. Friedman’s novels. Everything you wanted to know about Judaism but were afraid to ask. Goyim-friendly. Check out internet scams on this urban legends site before forwarding them to your friends! An amazing article on the Conficker worm, chock full of fascinating info on cyber-security. Scary, too. Ever wonder where Celia gets all the cool hand-dyed clothing she wears at cons? Wonder no more!